A friend once suggested that we should remove the writings of Robert Kiyosaki from a class curriculum. When I asked him why, he said that Kiyosaki’s books contain a number of errors. “Do the writings of Marx contain errors?” I responded. He agreed that these contain errors also. He said that the scriptures come to mind, but he couldn’t think of any other books with no errors. We had an excellent discussion, and he left agreeing that students were better off reading Kiyosaki and really thinking about it than not reading it at all. But the question concerned me because I’ve heard it so many times before. Like the concerned parent who didn’t want her son to read or discuss Lord of the Flies. After realizing that we would be discussing its flaws, she suddenly was very excited for her son to participate. Or the executive who objected to The Tipping Point because he felt that some of the conclusions weren’t adequately substantiated. When told he could share his views with the group, he was excited to attend. The amazing thing is that so many of us today just assume that if someone puts a book on a reading list she must agree with everything it says. Or we assume that if she has strong disagreements with something, she won’t recommend reading it — a sort of reverse censorship. The result is the end of learning. If you don’t study new ideas that challenge the accepted wisdom, all that is left is brainwashing. You end up with people who just accept whatever they read at face value; or you get people who believe they are deep thinkers because they know how to disagree with whatever they read. Both of these extremes are lacking. The whole point of an education is to learn the ability to discern between good and bad, right and wrong, excellent and mediocre, true and false, useful and irrelevant, etc. The best way to learn this is to experience great classics, and clarify their truths as well as their errors. Once we gain this skill, we should apply it to current books, ideas, candidates, etc. So why do we sometimes want to only read things we already agree with? At one level, it’s just more comfortable. But at another level, education is about pushing ourselves beyond our comfort zones — especially in our thinking. Unfortunately, we may be living in a strange conveyor belt saturated world with two competing sides — the Censors and the Bashers*. The Censors only want to read things without errors or personality. In other words, textbooks. Every teacher knows that the quickest way to get rid of controversy is just to “dumb something down”to professional or technical jargon. Ironically, when a book doesn’t say anything important, when it is “boring,” nobody seems to disagree with it. The new formula for selecting a curriculum seems to be: No Genius or Personality = Flat and Dumbed Down Reading = No Controversy = Good Curriculum. Of course, this makes for terrible education, because it shuts down thinking. The Censors don’t mean to do this, but the result of only reading what you agree with is the end of real thinking. As for the second group, the Bashers, they thrive on controversy. But they never build anything. They just attack, criticizing those who are trying to make a positive difference. Bashers never risk anything to make the world better, but they think they’re helping if they attack those who do. They are the natural response to the Censors. Censors try to make sure that no controversy occurs, and in the process they unwittingly stop thinking (and suggest that everyone else do the same). Of course, it’s vital to shelter children from evil and confusion, but Censors take it to the level of trying to shelter adults from dangerous ideas. In history, this always has terrible results — from Caesar to Hitler. Bashers criticize the Hitlers of the world, but attack good ideas with just as much gusto. In fact, Bashers have come to believe that thinking means criticizing. 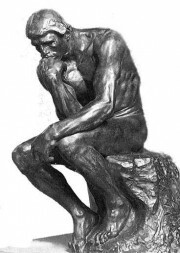 They seldom use the word “thinking” without the modifier “critical” thinking. But real thinking, including actually applying new ideas to build and improve the world, requires much more. Bashers, on the other hand, read the same books and say: “Here are all the errors; let’s list them one by one and focus on them. They believe this is critical thinking, but most of the time it only amounts to criticizing. Educated people, in contrast, read with eye for errors and also an openness to truth and application—whatever the source. In fact, that’s a good definition of what it means to be educated: the ability to recognize and apply truth, regardless of its source or delivery. As a result, a truly educated people is a free people. What we need is to be thinking people, and that is the purpose of education. Let’s read the challenging books of our time, and carefully think about what they say. Where they’re wrong, let’s discuss and learn from the errors. Where they’re right, let’s work hard and take risks to apply them and build a better world. As my friend and I finished our conversation, he surprised me — and taught me something. The truth is, most people aren’t really Censors or Bashers at heart. We just get into bad habits. Most people are really Builders, if you give them a chance. In a world where widespread Conveyor Belt thinking has conditioned many of us to automatically censor or bash new ideas, we all need to do more thinking. This simple but profound change could make all the difference in our society’s future. It would certainly have a wonderfully positive impact on modern education — or even just the personal education of anyone who applies it. I think my answer surprised him, too: “I suggest that you start by reading Kiyosaki again, and this time write out a list of everything you learn that is true. Then put it next to your list of errors. To his credit, my friend was open and excited to think, learn, and build. Oliver DeMille is the author of A Thomas Jefferson Education, The Coming Aristocracy and other books on education and freedom. He has taught graduate courses on the complete writings of Thomas Jefferson, The Federalist Papers, Aristotle’s Politics and other great classics of liberty. Oliver is a popular keynote speaker, writer and business consultant. Presently, he is active as a founding partner with The Center for Social Leadership and he devotes a majority of his time to writing. Oliver is married to the former Rachel Pinegar. They have eight children. I believe that people are looking for a modern-day ‘canon’. Maybe a reading list could, or should, reflect what the particular philosophical canon is, or is not.